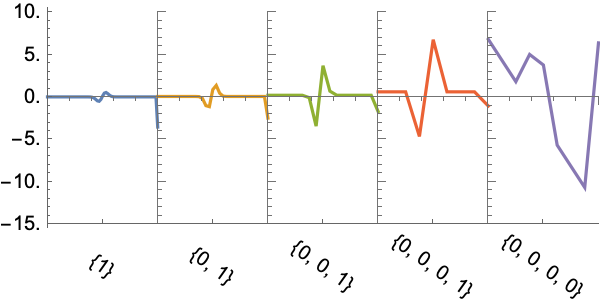 plots wavelet transform coefficients in the DiscreteWaveletData dwd. 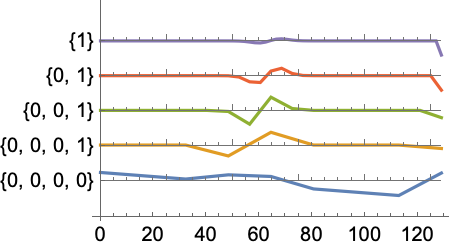 plots wavelet transform coefficients corresponding to the wavelet index specification wind. plots wavelet transform coefficients from several DiscreteWaveletData objects dwd1, dwd2, …. WaveletListPlot works for DiscreteWaveletData coming from 1D array data. The wavelet index specification wind is the same as used by DiscreteWaveletData. WaveletListPlot[dwd] is equivalent to WaveletListPlot[dwd,Automatic]. Possible settings for PlotLayout include: "CommonXAxis" and "CommonYAxis". With the setting "CommonXAxis", coefficients are plotted against a common horizontal axis where the independent axes are separately scaled to occupy the same amount of vertical space. With the setting "CommonYAxis", coefficients are plotted using a common vertical axis where the independent axes are separately scaled to occupy the same amount of horizontal space. WaveletListPlot returns a Graphics object.